Before I dive into our master closet, let me share a little backstory. In our previous home, I had a full bedroom in which I hung shelving and used as a dressing room. I even had my huge fuchsia ottoman plopped directly in the center of the room. The actual closet in our bedroom was reserved for my husband. Wow, did I take that for granted! Our master closet now is located directly over the garage, and one of my biggest regrets is not opting for a three-car garage. Not for the garage space, but for the extra car length of closet space we would have had. Our closet isn’t small, but has some challenges. First of all, combining two closets (one of which was a bedroom) into one regular sized closet called for purging… LOTS of purging before moving in. Another challenge is our walls have a deep vault which limits wall space and leaves very little height to hang shelving. I knew that to make it all work, we would have to be super creative and use every bit of available space. 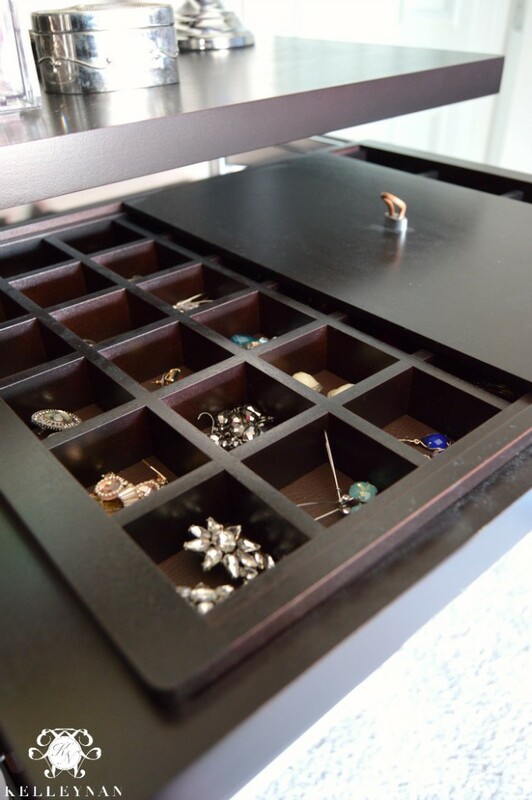 Being a huge fan of The Container Store, I opted for an Elfa closet system since they are literally what I think of when I hear “organization”. 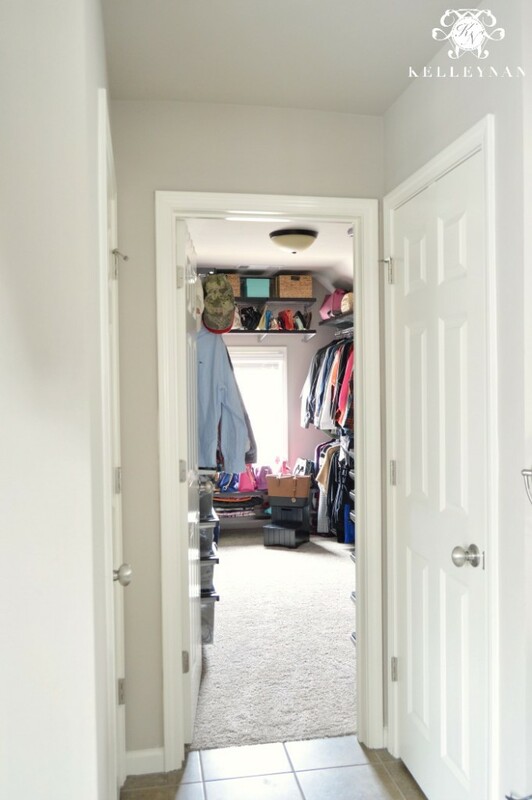 As a warning, our closet isn’t necessarily “pretty” and I would like to make some adjustments, but the real value here is the solutions we were able to implement to make our odd-shaped, vaulted ceiling closet work. The great and easy advantage of the Elfa system is that everything connects off of one top track. Once that track is mounted horizontally, the rest of the components attached to bars hanging from the top track. Ours vertical bars are screwed in for added support, but in the world of shelf-hanging and closet systems, this one is a cinch (well, at least that’s what I hear… we still had them perform the installation to ensure it was all constructed correctly and quickly). We met with a specialist in-store, closet dimensions in hand. VERY detailed dimensions… The specialist took the measurements and created a virtual mock-up of the space. We discussed priorities and estimated volume of clothes, shoes etc. When we built out the basics, we moved on to see where we could fit the added extras. With our limited space, I wanted to nix my jewelry armoire; I envisioned a sort of “station” on the short wall to the right when you first enter (more on that in a bit). Since the door opens in on the left, it made sense for me to take the right side of the closet. On one side, I chose a tall-hanging rack for dresses, kimonos, and other long attire. That rack is positioned just tall enough so a shelf can be positioned on top. I have a long, short hanging rack spanning most of the wall. On one bottom half, I have a double rack and the other half contains pull out shoe organizers. As I mentioned, the vaulted ceiling is deep which limits the rows and width of space between the rows. Ideally, I would have them spaced a little further apart, but we have maximized the wall space. I keep larger bags and floppy hats on the top shelves which is basically a small triangular space. I would eventually like to find a series of baskets small enough to fit on those shelves. The funny thing about the shoe organizers is that the drawers for heels hold nine pairs in a space that would typically fit three. I underestimated their capacity when I majorly downsized so I still have plenty of room to grow. 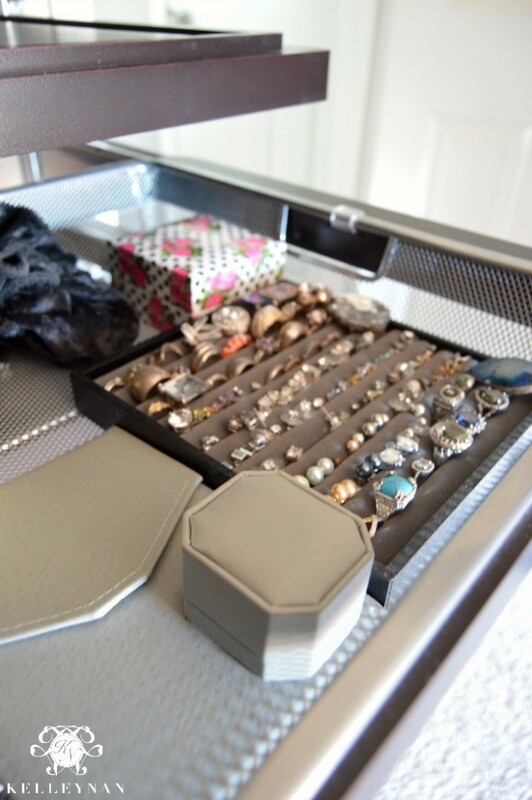 The other shoe drawers hold flats, sandals, and wedges; they hold six pairs per drawer. Flip flops are stored in an over-the-door hanging bag organizer, slippers are kept in a basket on the floor, and tennis shoes and boots are kept on upper shelves. The bottom drawers in my short wall station hold bathing suits, gym wear, and one drawer is completely devoted to items which need to be taken to the dry cleaners. The basket on top contains boxes and bags of jewelry which doesn’t get much “action”. The window at the back of the closet didn’t provide any hanging room, but was perfect to set up some shelving for bags and purses. The blue Tiffany box holds gloves, mittens, and ear warmers – I rarely access those but keep a step stool down below just in case. Smaller purses and clutches are housed up top while some of my larger, more frequently used purses are more prominently displayed on the bottom shelf. Thin/foldable bags are stacked on this narrow shelf; this has worked well for quick and easy access. When I am being “responsible”, I keep the current purse I am using sitting atop my little step stool so I can grab it and run quickly. This tote was a gift from my mom this past Christmas. I have a healthy collection of purses thankfully, and almost exclusively, most of them have been gifted by her. (Thanks, Nan!) I don’t know that the black and tan version is still available, but you can find an all-tan version HERE. My husband’s side of the closet consists totally of short hanging shelves. I actually keep fleeces and hoodies on his side also, toward the back. We both have retractable valet hooks which we love. 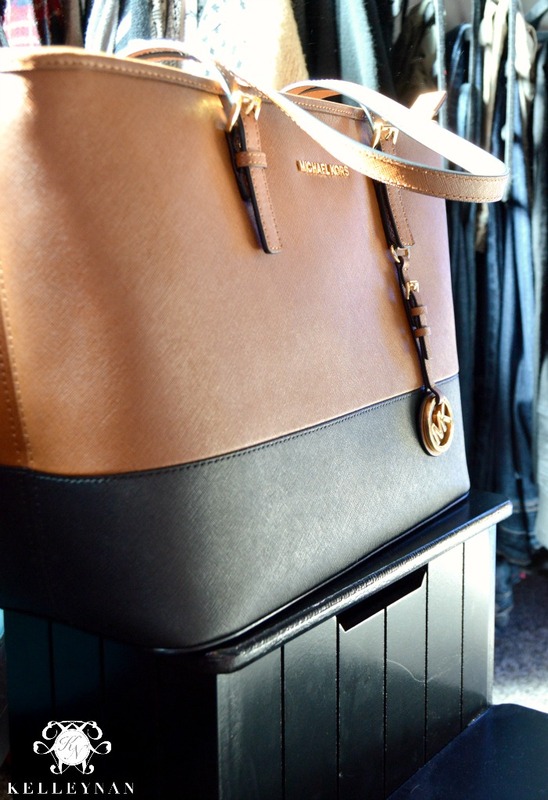 I didn’t know how often I would use it, but it makes preparing for a trip or planning an outfit much simpler. 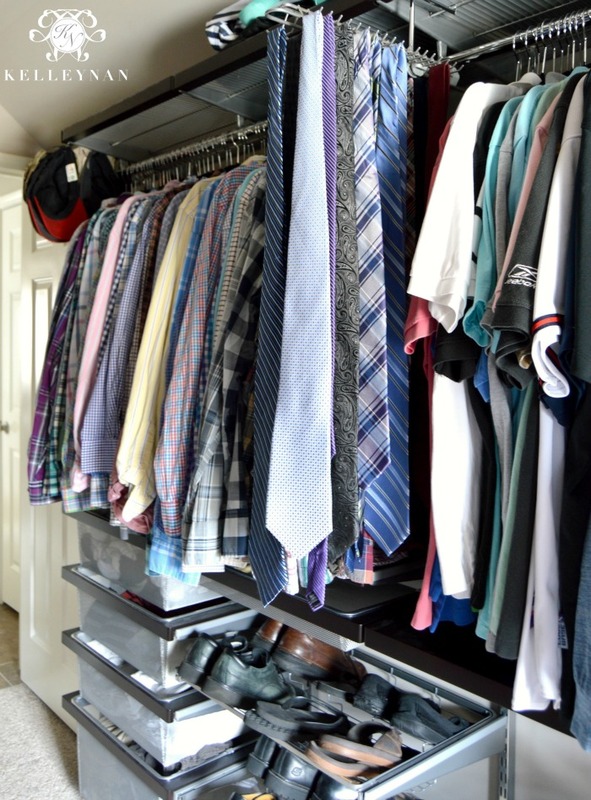 He has a sliding tie rack separating his button-downs and polos, a set of drawers for shorts, socks, and undergarments, pull out shoe organizers, and even a couple of “hidden” drawers for fun accessories like his boot assist. 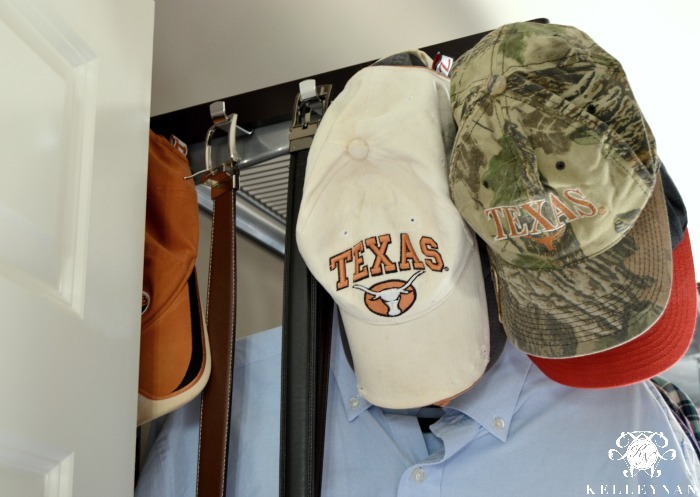 We had hooks put on the end of the shelf, close to the door, for hats and belts, and he has a little shelf attachment for his loose change/watch/etc. 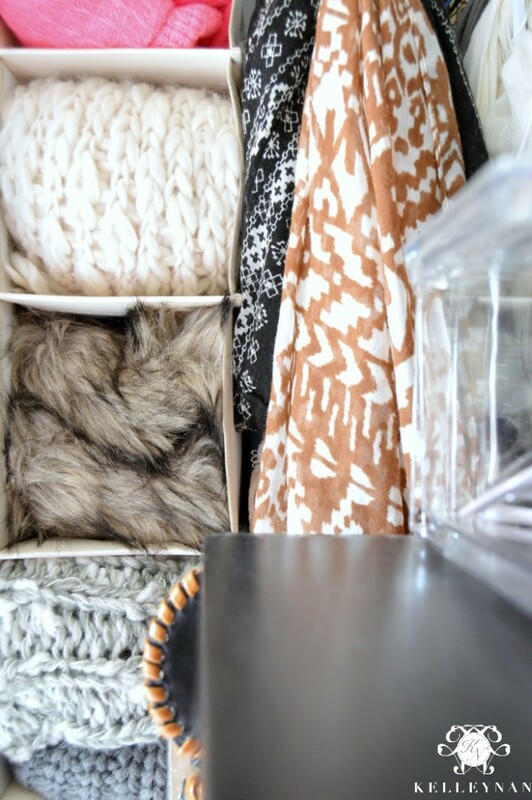 Back on my side of the closet, next to my jewelry/side station on the long, hanging bar, I keep my scarves. Ok, so with several folded blanket scarves on the above shelf, a hanging organizer for thick scarves, and two looped scarf hangers for thin and infinity scarves, I may not have this system “down” just yet! haha- As I said, I still have a lot I eventually want to do in here and streamlining some of my solutions will be priority. 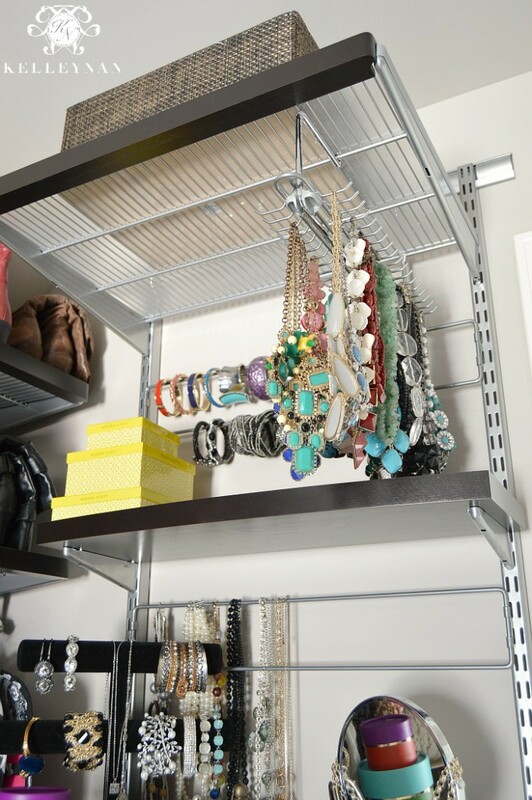 Next to the scarves on the long hanging rack are hanging jewelry organizers. I keep pieces that I wear more often than those shunned to the top box, but not as often as those out for display. I also have a series of belt hooks on the left side of my little station. My beaded necklaces are on a little pull-out rack on the top shelf, and I have these cross-bars which I use for bracelets and thinner necklaces. I have considered using the cross-bars for my scarves in some way. If I do end up going that route, I will be sure to post an update.
. I love a timeless, lifetime purse, but when it comes to sunglasses, I am the most irresponsible person ever. The cheaper, the better, because I will eventually lose them (but not before I scratch and break them). and the second holds various jewelry pouches, rings, studs, and the few nice pieces I keep in leather pouches. I keep my favorite Kendra Scott necklaces out, draped across my mirror. 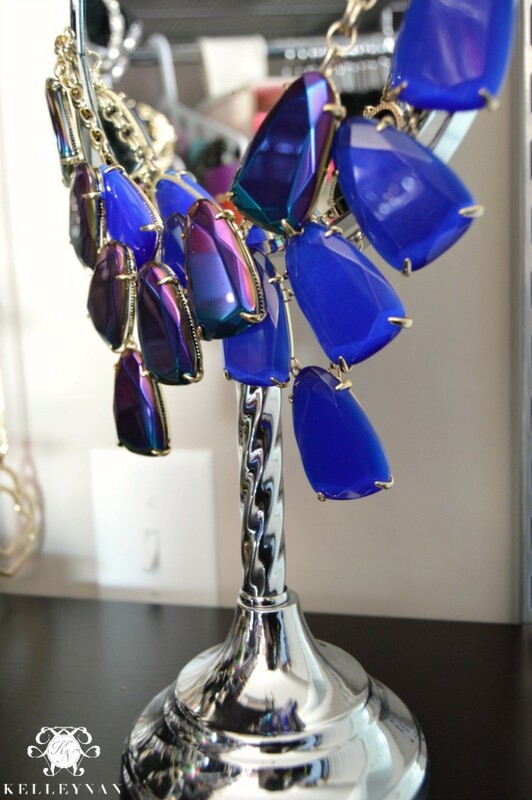 You can find the blue necklace HERE or the iridescent (currently on sale for 60% off!) HERE. I know this post has probably sounded like a paid advertisement for The Container Store, but I promise it isn’t! I just thought this space would be perfect to share since they are currently running their annual Elfa sale where all Elfa products are 30% off, including installation… and this annual sale really gets me pumped up! We purchased our system last year during the sale even though our house wasn’t completed just yet. They were totally flexible in letting us purchase then and schedule our installation appointment a month later (they brought all the closet components). 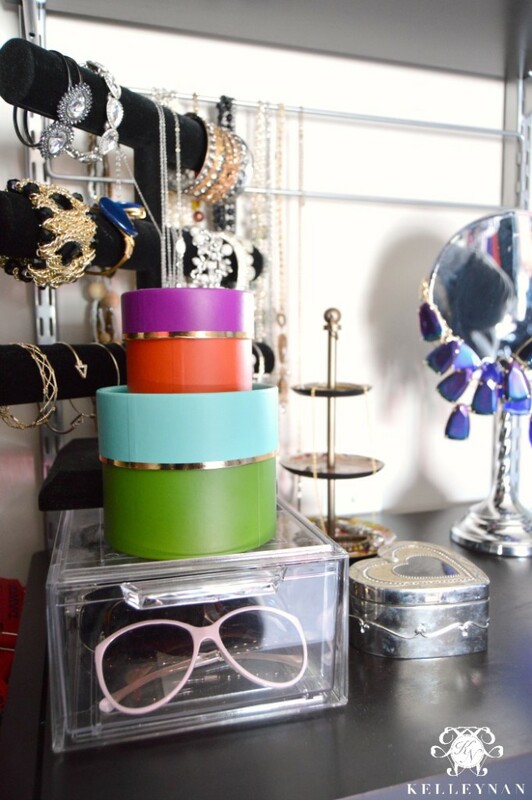 If you are in need of closet inspiration or storage solutions, they are a great place to start your inspiration. 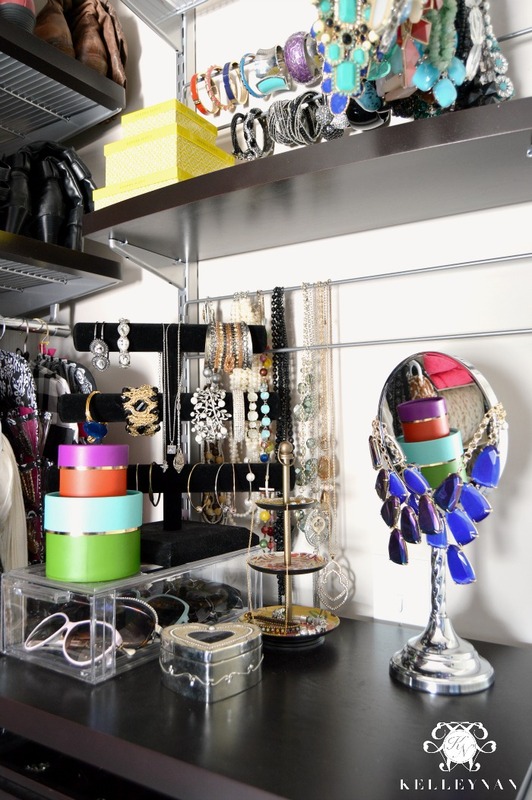 When it comes to closet solutions, 30% is huge; it saved us over $1,500! So, this time of the year and this time of the year alone, I stock up on Elfa products. You can find more information about their systems HERE. I would love to hear if you have or are planning to make a trip to The Container Store in celebration of the annual event, and if so, would love for you to share your organization project! I love this so much. As you know, the Elfa closet door systems changed my life! Well, that may be a bit strong, but I do love how they have been the perfect vehicle for better storage and organization. 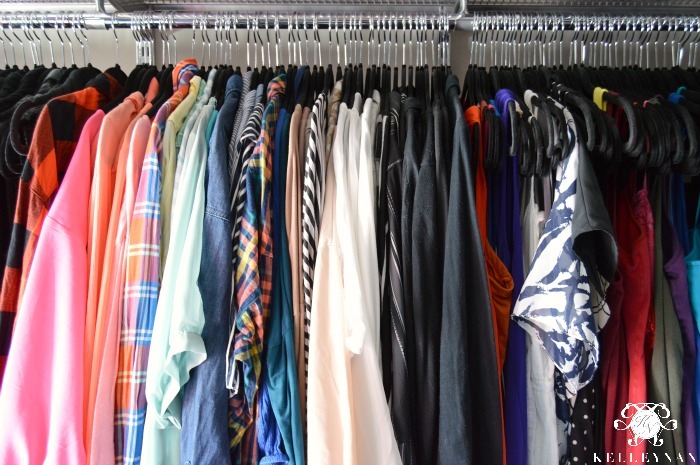 Your closet is a dream! Elsa is the only way to go! Ultimate space usage…and so versatile. 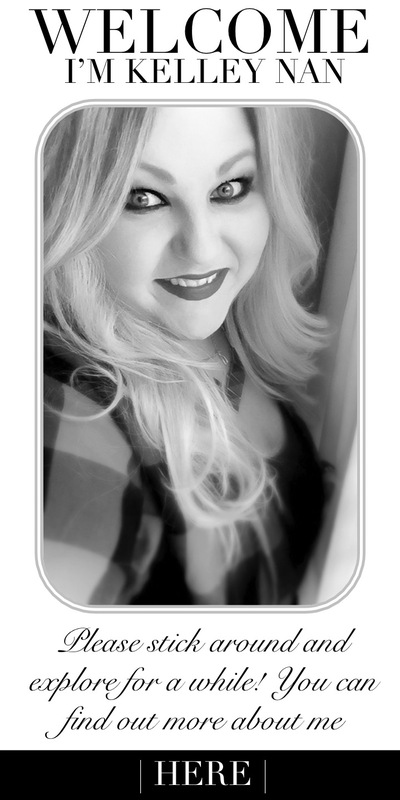 Would ‘t trade mine….so glad you have yours! 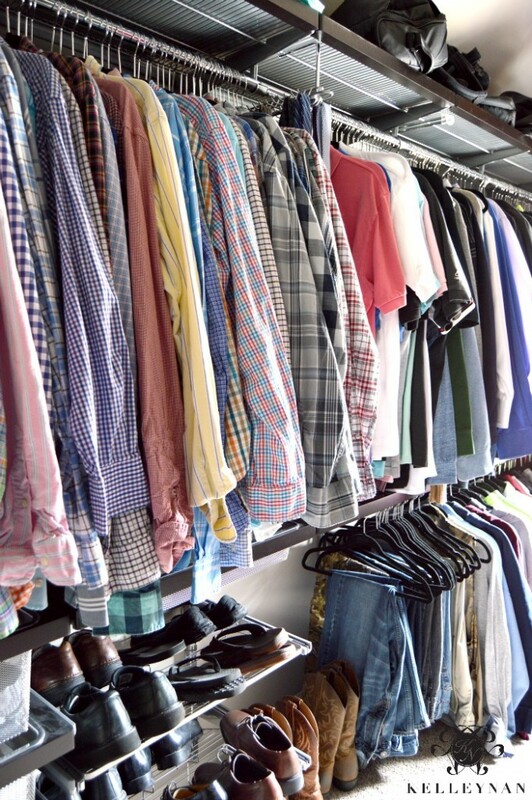 Great closet! Debbie, thank you! If you really are trying to use every available inch, they are your people! Girl, they are so easy to work with! I love it! Haha! Eileen, I am so glad you caught that! 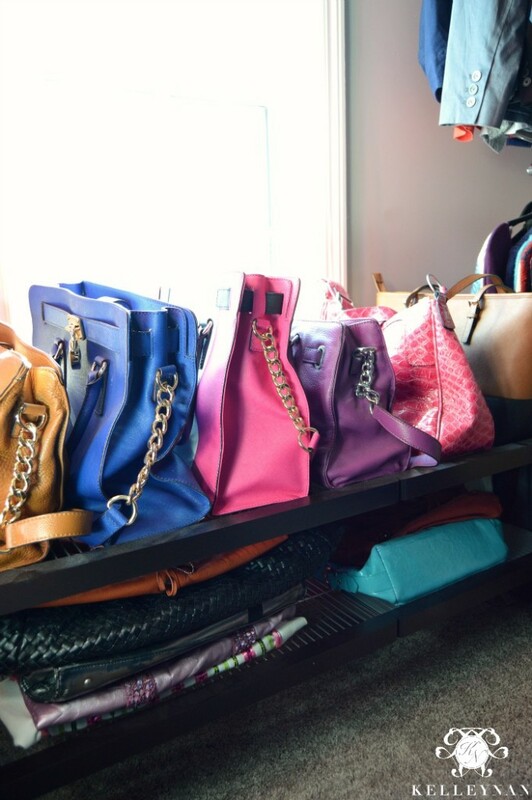 Love love love your closet! Great design! I moved in nov 2016 to a house with a closet like yours and did very close to the same thing in jan 17 with the ELFA sale. I too sound like an ad for ELFA! But it was a huge savings and a Pleasure for me to use every day. 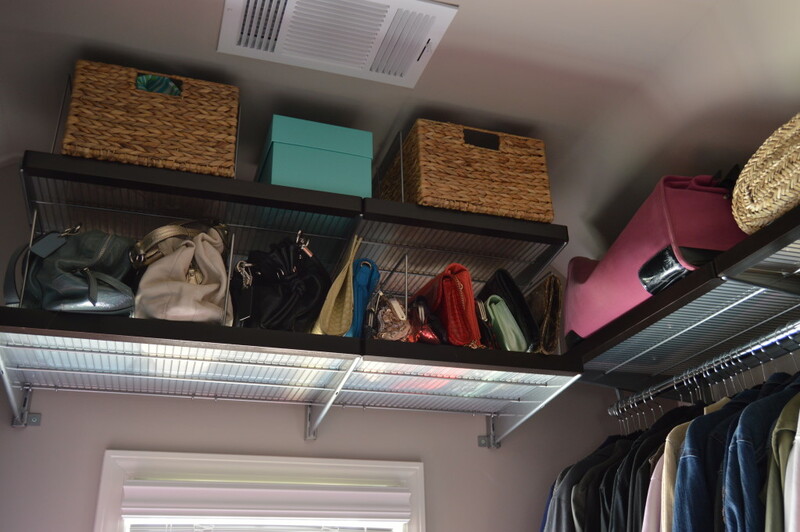 I struggle with the top trangulated shelves too with the vaulted ceilings and just store up purses there. Thanks for showing the detail – you gave me a few ideas for my jewelry. Theresa, I feel like people who KNOW Elfa are obsessed and those who don’t may not “get it” haha! That is a fantastic plan!! !